This product is no longer available and has been replaced by: CFMC256M. The CFMC64M is a 64 MB, industrial-grade CompactFlash card that has passed Campbell Scientific's ESD testing. It is used with the CFM100, NL115, or CF1 to expand data logger memory. 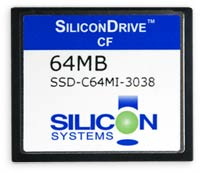 The CFMC64M, manufactured by Silicon Systems, stores 64 Mbytes of data. This industrial-grade CompactFlash card has passed Campbell Scientific's ESD testing. One CFMC64M card is used with a CFM100, NL115, or CF1 to expand the data logger's memory or transport data/programs from the field site(s) to the office. The card can also store JPEG images of the CC640 digital camera. A PC can read/write data stored on the CFMC64M by using either the CF1 CompactFlash adapter or 17752 Reader/Writer. Cards purchased after August 2008 are formatted as FAT32; our contemporary data loggers require this format for the card to work as expected. Cards purchased before August 2008 were formatted as FAT16. Our CC640 camera (retired), the CR9000 dataloggers (retired), and CR5000 dataloggers with older operating systems need the FAT16 format. A card formatted as FAT32 can be reformatted as FAT16.